This a top-class viola made by a top-class luthier. The attention to detail in its construction is fantastic, including elegant corners, highly symmetric sound holes, and a beautifully carved scroll. 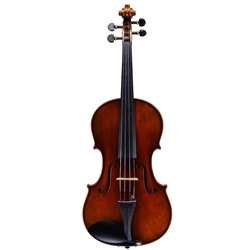 This viola is far more than just a good looker, and has a big operatic voice with exceptional clarity in the low register. The top is made from spruce with arrow-straight grain, complemented by a very highly flamed maple back, neck, and set of ribs. The varnish is a red-brown over an amber ground, and the fittings are ebony with boxwood accents for a very distinguished look.